The table below details our fuel mix for electricity supplied by Yü Energy for the 12 months ending 31st March 2018. For more information on the environmental impact of your electricity supply, please contact us or call 0115 975 8258. 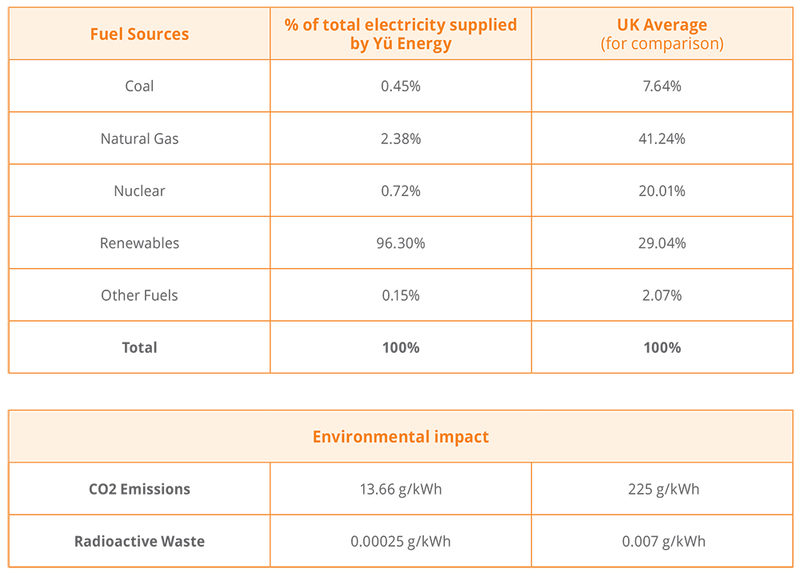 At Yü Energy, we aim to secure as much of our electricity as possible from renewable sources, so that our customers can enjoy a cleaner energy supply. Over the 12 months from April 2017 to March 2018, over 96% of the energy we supplied to our customers came from renewable generators. We will continue to use renewable sources of electricity where we can as part of our commitment to help reduce climate change and maintain a greener energy supply. When we purchase energy from renewable sources, we receive a certificate called an EU Guarantee of Origin (or GoO.) This is a certificate which provides evidence that the power produced is 100% renewable.